Kathryn Bigelow probably needs to direct more, her rap-sheet includes The Hurt Locker, Near Dark and even Blue Steel was pretty good. And Point Break, the ultimate 90s (teen) action film. For some reason I wasn’t that blown away by this when it came out despite being the perfect age of 17 or 18. I think it is because the so called x-treme sports have never grabbed me, BMX, skateboarding and in the case of Point Break surfing and sky-diving just never seemed that awesome. 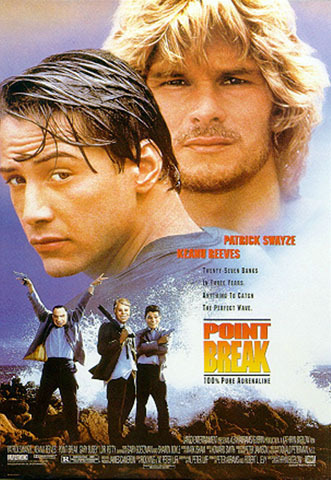 But nonetheless Point Break moves quickly has a lot of action crammed in to a “yeah right!” plot. Keanu Reeves is rookie detective Johnny Utah (Woah), and Gary Busey is his grizzled and initially unwilling partner Angelo Pappas. They are assigned to track down a bank-robbing gang called the “Ex-Presidents”, so named for the masks that the 4 guys wear when performing their efficient, successful and largely non-violent heists. Angelo has a theory that he is initially reluctant to share: that the robbers are in fact surfers who pull the jobs to finance their bohemian adrenalin-chasing lifestyle, and who follow the Summer around. Now apparently Summer is almost over, so the window to catch them this year is coming to a close, so the hokily named Utah must go undercover as a surfer to attempt to discover the identity of the robbers. Cue a couple of montages which show his progress from newbie to meh surfer over the course of a few minutes, all while under the tutelage of local experienced surfer-girl Tyler, played by a pint sized Lori Petty. Now Point Break is two hours long, most of that action sequences, so Utah can’t waste time in tracking down the Ex-Presidents or we’ll have a 4 hour movie on our hands. This necessitates some cinematic coincidences. Tyler is the sometime girlfriend of a renowned local surfer named Bohdi, (Lucky!) upon the first meeting between Bohdi and Utah they get along just fine despite him hanging around his missus, (Lucky!) and he is invited to join in an impromptu game of NFL (Lucky! ), where it comes to light that Utah was a star college quarterback who only left the game through a chronic injury. When this is made public all semblance of resentment and mistrust between Utah and the surfers evaporates. Who knew his past identity? Bohdi, that’s who! (Lucky!) Bohdi is played by Patrick Swayze. Shortly after this meeting Utah surfs the local beach again after being directed there by some evidence left at a hold up crime-scene. A scuffle between him and the locals breaks out, only to be broken up by… do I even need to say it? So Bohdi then invites Utah around to his house for a party that night to drink his beer, enjoy his company and nail his missus, and Johnny Utah does all three! Shortly after a raid-gone-wrong on some surfing suspect’s pad, Utah realizes that he was hanging out with the robbers all along. You could call it his “woah” moment, but that might have been done before. Again Summer is ending and time is running out, so Pappas and Utah follow the group (basically Swayze and three faceless dudes there to provide enough numbers to call them a “group”) to a bank that they may be casing. They arrive moments too late after yet another cinematic sandwich-related diversion (when will Hollywood give up on this gimmickry? ), and after a long chase scene on foot Utah finds he has no choice but to shoot several rounds pointlessly into the air, rather than shoot the guy he just chased in the leg or something. Such is the bond built by a few random meetings and brief experiences. Now the cat is out of the bag and Utah’s true identity is known to the Ex-Prez, so they have taken Tyler hostage and will kill her if Utah gets in the way of their last job of the season and subsequent escape. Of course Utah can’t just let them go, and the movie closes with a few more chases, gunfights, a robbery and wait for it, some skydiving. Final Rating – 7 / 10. Not the all time classic this is described as on occasion, but an effective action movie with the emphasis on action.